A whopping six battles will be waged this week between teams with winning records, a Week 15 record according to the Elias Sports Bureau. Get your popcorn ready for Giants-Falcons, Packers-Bears, Broncos-Ravens, Colts-Texans, Steelers-Cowboys, and 49ers-Patriots. Who will clinch? Who will fall out of the picture? Let’s break down the numbers to find out what could be in store (all odds provided by Sportsbook.ag). 4 - Consecutive wins heading into last Sunday for Cincinnati, which was on the verge of making it five before allowing 10 points in the final minutes in a 20-19 home loss to Dallas. It is also the number of consecutive opponents that the Bengals have held to fewer than 300 yards of total offense. Additionally, it’s the number of Philadelphia victories this season-all of which are of the come-from-behind variety and have come by a combined six points (the Eagles edged Tampa Bay 23-21 last week). Cincy, which still controls its own destiny for an AFC wild card spot, is a -4 road favorite on Thursday night. 0 - Touchdowns scored by the Chicago defense in its last five games. Plenty of other teams have done the same in this span, but for the Bears it is an aberration. They scored seven defensive touchdowns in their first eight contests. Furthermore, Chicago has allowed an average of 141 rushing yards in its last seven outings after surrendering a mere 71 yards per game in its first six. Julius Peppers and company, who have lost four of their past five, must beat Green Bay on Sunday in order to stay alive in the NFC North. The Packers are -3 road favorites. 2 - Number of men, per a report this week, who were arrested last month for plotting to kill and castrate Justin Bieber. The Toronto Star is reporting that there was a $2,500 bounty for each of Bieber's testicles…. On that note, it’s time to get back to football. Two is also the number of personalities the Steelers have shown of late. 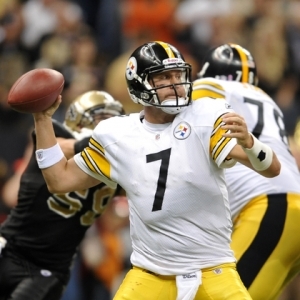 In the last three weeks, they committed eight turnovers in a loss to Cleveland, upset Baltimore on the road with a backup a quarterback (Charlie Batch), and got manhandled at home by lowly San Diego with their starting quarterback (Ben Roethlisberger). Pittsburgh is a -2 road favorite at Dallas. 35 - Number of passes either batted or tipped by Houston this season, most in the NFL. Fifteen of those have come courtesy of J.J. Watt. Andrew Luck, whom the Texans are facing on Sunday, has a league-high 21 passes batted or tipped through 13 games. That bodes well Houston’s defense, but recent performances do not. The unit has allowed more than 30 points in three of its last four games, including 42 to New England on Monday night. Houston is a -8.5 home favorite on Sunday. 284 - Rushing yards racked up last week by the Seahawks-their fourth most in franchise history-in a 58-0 humiliation of Arizona. They are now averaging 152.3 yards per game on the ground, fourth best in the NFL this season. Marshawn Lynch scored three touchdowns last weekend, and he has seven in his last six outings. Arizona, of course, is by far the worst team in the league right now and 30th against the run. But the Bills aren’t much better. They are 28th in the league in rush defense, allowing 134.5 yards per game. Seattle is a -5.5 road favorite in Week 15. 10.10.10 - In a week that featured 12/12/12, it’s worth noting that the last time the Broncos and Ravens faced each other was on 10/10/10. Why does that matter? It doesn’t. Nor does the fact that Baltimore won 31-17, because Denver was a completely different team than it is now. How ‘bout some numbers that do matter? Peyton Manning is just 188 passing yards short of becoming the first player in NFL history to have 12 seasons of 4,000 yards. Demaryius Thomas, one of Manning’s favorite targets, is averaging 96 yards per game on road in 2012. The Broncos are -3 road favorites against the Ravens on Sunday. 14 - Career games for Tom Brady in which he has thrown at least four touchdowns without an interception, an NFL all-time record. He had his second such game of this season when New England clobbered Houston on Monday night, 42-24. The Patriots, meanwhile, have won 13 consecutive December games dating back to Dec. 6, 2009. They have won 20 straight December home games. Brady’s Patriots will look to keep both streaks going when they host San Francisco as -6 favorites in Sunday night’s showdown. 2 - Third downs, in 32 attempts, converted against the Jets in their last two games. Using a stingy defense, New York edged Arizona 7-6 (insert LOL here) then went into Jacksonville last weekend and prevailed, 17-10. The Jets, who are actually still alive for a playoff berth with a 6-7 record, boast a defensive unit that is eighth in the NFL overall and third against the pass. Another soft, offensively-challenged opponent is on the horizon. Tennessee, which is 4-9 and in the midst of a three-game slide, is a -1.5 home favorite on Monday night. 1 - Turnovers forced by the Dolphins in their last six outings. Not coincidentally, they are 1-5 in this current span. 7 - Number of Bucs-Saints games out of the last eight that have seen the “over/under” go under. However, the one game that went over the total was this season in Week 7, when New Orleans won 35-28. 23 - Points by which the Browns, who have won three in a row, beat Kansas City in Week 14. It is their largest margin of victory since Nov. 16, 2003. 78.3 - Christian Ponder’s quarterback rating this season, worst among current NFC starting QBs. All 12 of Ponder’s interceptions have come in his last nine games. 397.3 - Yards being averaged by the Panthers in their last four games, during which Cam Newton has 11 total touchdowns.